2019 is officially DIY Splashbacks' Year of the Mirror. 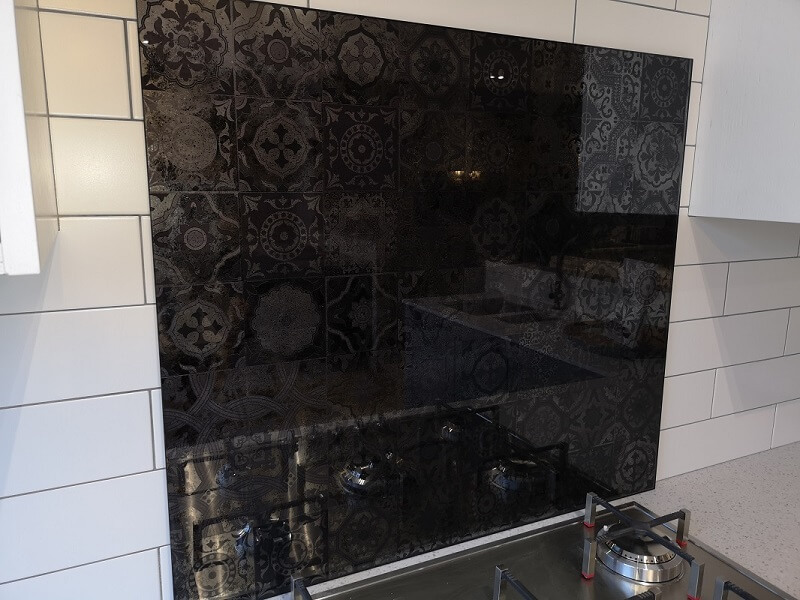 We are going to be adding some unique, highly bespoke mirror products to our portfolio this year and to start us off let us present too you this stunning Moroccan Tiles Antique Mirror Glass Splashback. As with all of our glass splashbacks, this is made from toughened glass so can be used behind any hob, including gas. 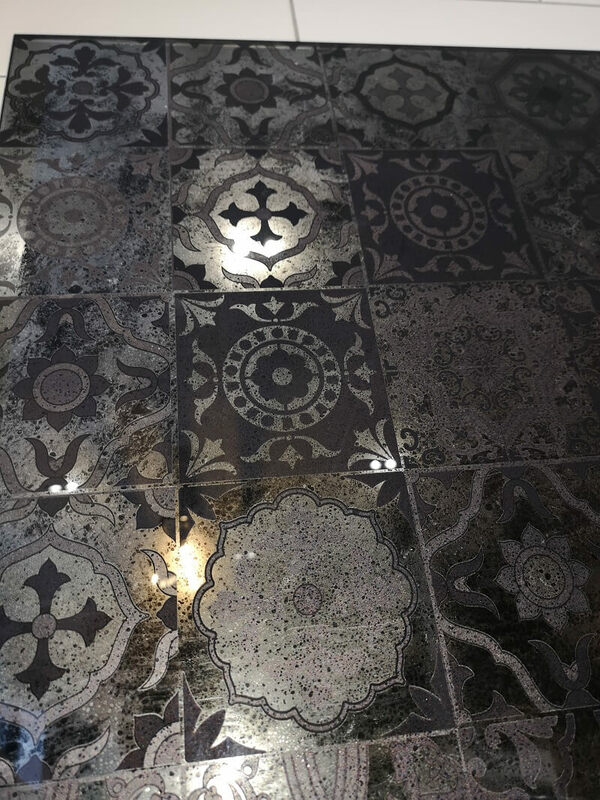 The tile pattern is a recreation of some of the most popular moroccan tile designs, all in grey scale, with a highly reflective mirror finish. 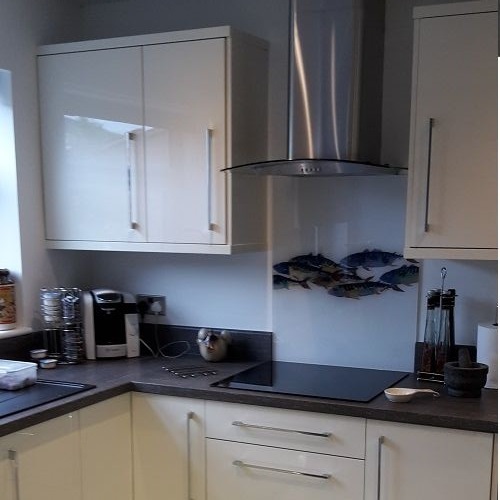 The splashback pictured here is a bespoke size but we can manufacture and deliver in any size up to a maximum size of 1.5 metres by 2.5 metres. 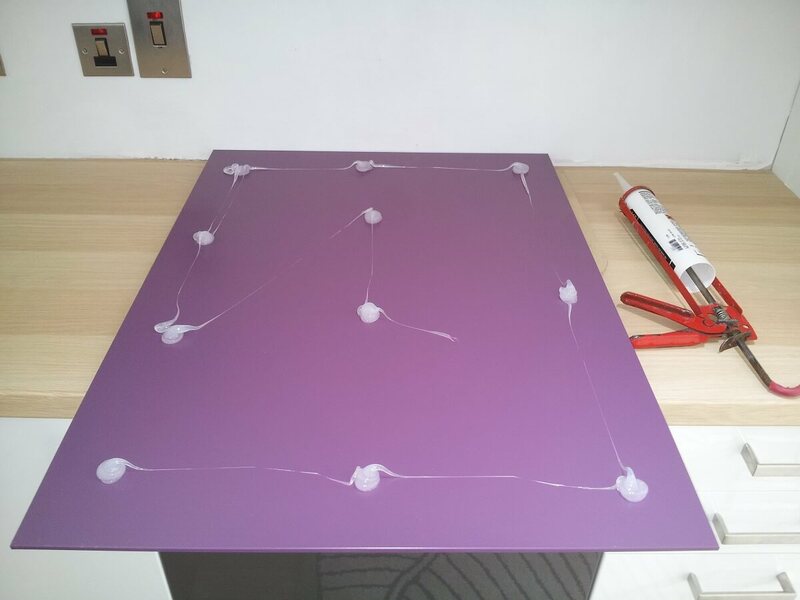 Our splashbacks can also be cut to fit around (behind) electrical sockets and we can even recommend installers across the UK who can fully measure and fit our products for you. For more information on this exciting new product, you can visit the product page or email us. When new kitchen worktops are installed it can be nice, especially with stone and quartz, to continue this around your kitchen with matching upstands and cooker splashback. A nice high gloss complimentary finishing touch can be coloured acrylic splashbacks. The reflective, glass effect, finish can really lift the kitchen and add more light and colour to areas that are usually overlooked (and hard to clean). The below example makes a feature out of areas above, under and around the kitchen cupboards and we are sure you will agree brings a real pop to the kitchen colour palette. This kitchen looks so much more vibrant with this extra colour added and the problem areas to keep clean are now much easier to maintain. 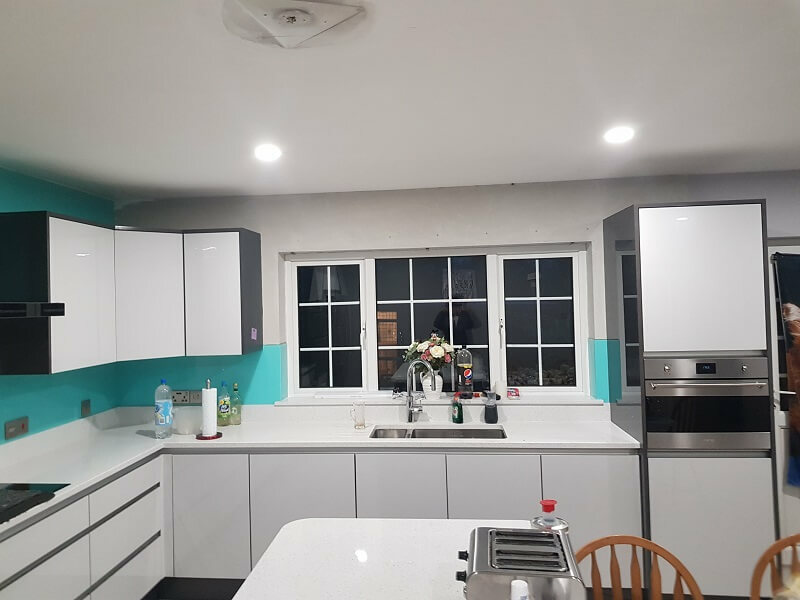 Our acrylic splashbacks are very easily cut using HSS drill and jigsaw bits (do not use normal power tool bits, HSS bits have many more, smaller, teeth and will not cause any problems). Using our cutting service we can cut the panels to the correct heights and widths for you leaving you to simply cut around sockets using conventional power tools. You can of course also ask your kitchen fitter to do this, it's just as easy as cutting a laminate worktop! Acrylic is not only suitable for most areas in the kitchen but you can also use it in the bathroom to create seamless coloured, easy to clean walls. Shower panels without the need for grout are a must as you minimise the number of areas where moisture sits therefore less areas where mould can grow. Add our easy clean coating and your shower or bathroom walls will be incredibly low maintenance as the water will run off just as it does with self cleaning glass windows. You can check prices and preview thousands of colours on our acrylic splashbacks page here. Acrylic Splashbacks are incredibly easy to fit, you are essentially sticking a lighweight panel to a wall using silicone. Below is more detail on the steps required. Apply our Neutral Cure Silicone to the rear painted side of the panel. It is low modulus, so for really uneven walls you can use more in any shallow areas and it will be asily compressed. As our glass splashbacks are made from low iron glass and the acrylic is high grade clear perspex, there is minimal colour distortion from either material. What this allows you to do is use both glass and acrylic panels on your kitchen wall- a glass splashback behind the heat source and should you wish to keep costs down by cutting the acrylic on site yourself acrylic splashbacks for the remaining walls. 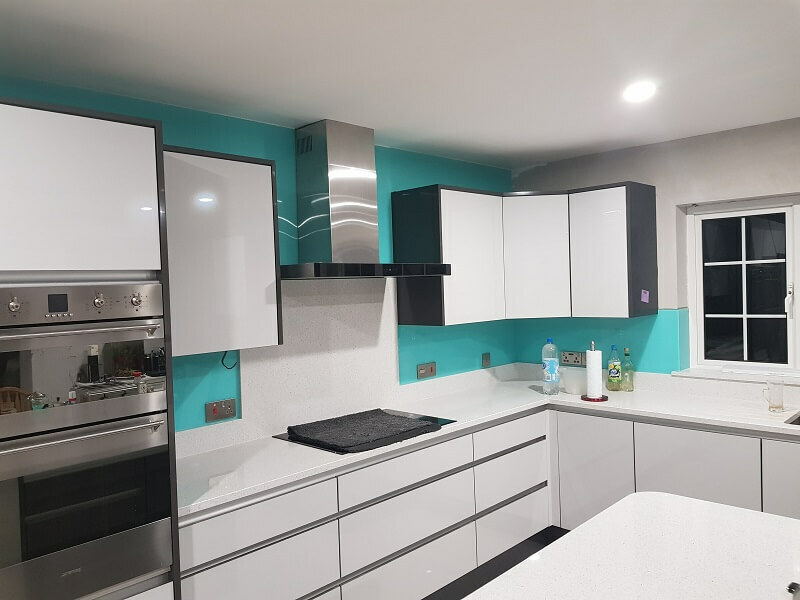 The high gloss finish of our glass splashbacks and the high gloss finish of our glass effect acrylic panels mean they are indistinguishable when side by side. As you can see, using the same colour of glass upstand as the glass splashback has really added a feature to this minimalist white gloss kitchen. The above is something you can very easily measure and fit yourself for a few hunder pounds and allows you to introduce stronger colours to your kitchen pallette without overdoing it. Due to their perfectly flat surfaces, newer splashback variations such as glass and acrylic are much easier to maintain. Windows are of course made from glass and very easy to clean although as you literally see through them it is easier to spot streaks. Glass splashbacks are back painted (or digitally printed) and much easier to clean- cleaning them with a dry micro fibre cloth is without doubt the easiest method. Medium grade wire wool can also be used though. Acrylic splashbacks can be scratched with abrasive cleaning products and cloths (and never use wire wool on acrylic! ), like glass though a microfibre cloth is perfect for mainting an acrylic splashback in the kitchen or bathroom. 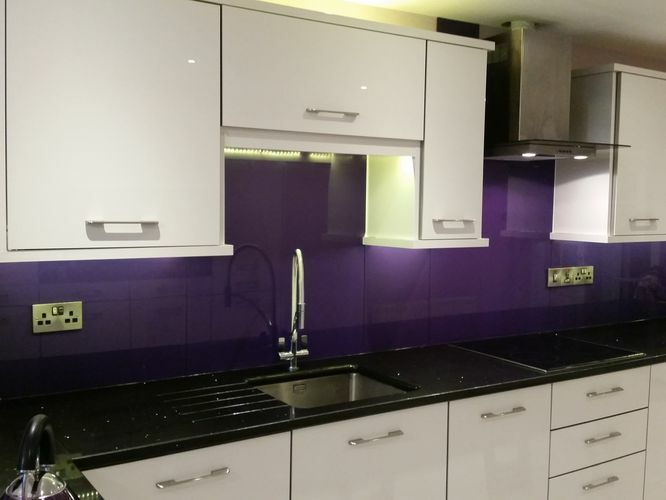 Glass and acrylic splashbacks can also be treated with a specialised coating to make them much easier to clean. What makes Glass Splashbacks (and Acrylic Splashbacks) so special? 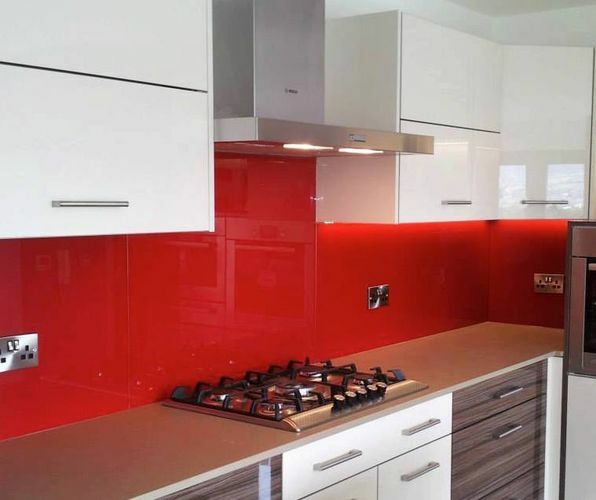 The cost of a glass splashback can vary depending on the size and specifications required. Should you require a simple 6mm thick cooker splashback for example it should be well under £200 for a typical size of 600mm x 750mm but again it depends on the specification. Solid colour or digital print, additional paint options like special effects and sparkles or indeed if you would like it shaped to fit your cooker hood. What makes this cost more affordable though is how easy it is to install a glass cooker splashback. As you are essentially just fitting a large tile in one panel it is a simple DIY task that should take no more than 10-15 minutes. It is also a task that anyone with even limited DIY skills can do with relative ease. Please see our tutorial on how to fit a glass splashback here. Can I fit glass splashbacks myself, how do I measure around the plug sockets? Again we have a number of tutorials on how to do this. If you are worried about correctly measuring around plug sockets you can of course install glass upstands. With a bit of thought and following our tutorials though you can indeed measure for a simple cooker splashback, a cooker splashback and upstands or a full wall including socket cut outs. If you need any advice our customer service team also have 10 years experience in measuring and fitting glass splashbacks, there's nothing they haven't came across before! Yes and no. While DIY Splashbacks only sell toughened glass splashbacks (along with many other splashback materials), once they have been toughened they cannot be cut. Glass is toughened by superheating it to over 400C in a furnace/toughening plant, this is also why they are so heat resistant. After they are superheated the glass is then rapidly cooled and the end result is glass that is incedibly hard to break (believe us, we throw our rejects into skips and very rarely manage to break them). What actually happens during the toughening process is the outer surfaces are compressed but the inner structure of the glass is put into tension- if you can imagine lots of little molecules all pushing against the surface of the glass providing strength to the outer "shield". This "shield" with all that force behind it is what is pushing against the surface of toughened glass when it is struck. What happens then when you breach this shield by cutting it? 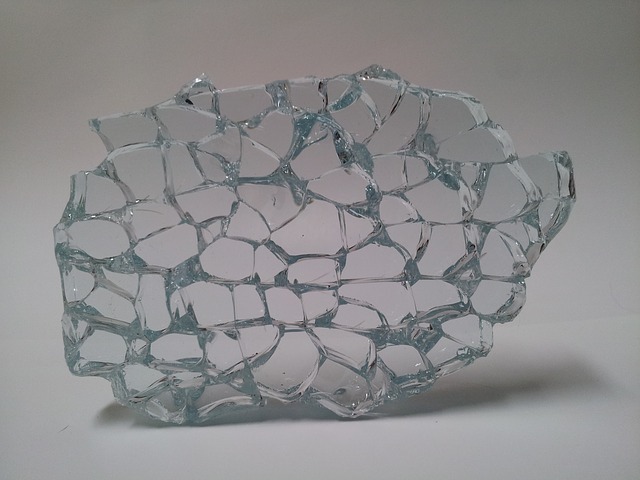 All the little molecules held back by the "shield" are then released causing the glass to crumble. It does though crumble into very small little cubes rather than shards and injuries are incredibly rare- this is why it is used in car windscreens, bus stops and is also known as toughened safety glass! What happens if my splashback is a little too wide or a little too high, what can I do? If you have incorrectly ordered and you find your splashback is a little too wide the simple solution if possible is to reomve your kitchen cabinet end panels, fit the glass and refit the end panels. The chances are you will need to trim a little from the back of them so you may need a kitchen fitter to do this for you but we supply and fit many jobs where we deliberately do this as it's a neater finish. If your splashback is a little too high it depends how much is it off by. You can usually unscrew the bottom teo screws inside your cooker hood (near the bottom) and budge it up a little for small measurements in a matter of minutes. For larger meaurements the extractor may need to come down completely and be rehung a little higher. Again though, we would recommend you use a kitchen fitter to carry out this relatively simple job. You've spent all you can afford on THE MOST EXPENSIVE ROOM OF YOUR HOME that adds the most value to your home...it costs nothing more to have the most perfectly coordinated wall covering in your kitchen. Why then install a black, white or non descript splashback in your kitchen? 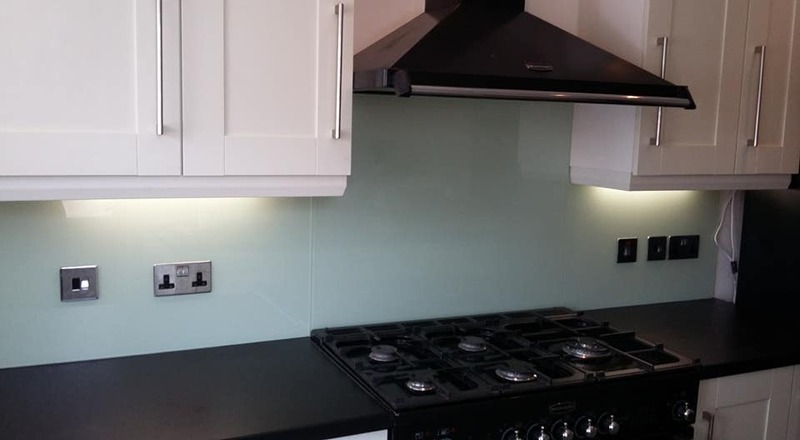 With a bit of thought, and nothing more in terms of cost, you can instead fit a glass or acrylic splashback that will add serious VALUE to your kitchen and indeed home. So, with that being said how do you go about choosing the perfect Coloured glass splashback or Printed glass splashback? Trends do change, as will your kitchen many times in your lifetime. The average consumer will change their kitchen every 7 years! Wall coverings should of course change at the same time but too many people make (and regret) tiling their entire kitchen walls only to end up keeping them for much longer than they would like simply because removing tiles is an incredibly messy and expensive task. This is not the case with splashbacks. Glass and acrylic splashbacks come off in one piece 9 times out of 10. Will you get bored of your choice of tiles you chose to match your kitchen which will inevitably date? Yes. Will you get bored of the splashback you have installed 7 years down the line when your once modern kitchen has dated. Of course! This should not away your decision on your kitchen wall covering, but...with splashbacks at least you can easily remove them. Do keep in trend though, your splashback should be the finishing touch to complete your dream kitchen so don't be afraid to DESIGN a splashback that can be the focal point or at least backdrop to your dream kitchen. In this day and age, where bespoke is no longer an expensive luxury only for the well off, you can have anything you want. The perfect view, a tasteful contrast, art or even a pattern you have designed yourself. Don't settle for ordinary, create something unique, something that makes you smile every time you look at it (your own photos of your favourite holiday or memory), something SPECIAL. It's not the 90s anymore. Stop decorating your house for the next owners, decorate it for you. Did you know that although you have spent a fortune on YOUR dream kitchen the majority of people who purchase a home will change the kitchen within 3 years? Even brand new kitchens. We all have our own taste, so don't decorate your home to suit the next owner because it won't! It's YOUR dream kitchen, decorate it to your taste. With that in mind we decided to give you unlimited choice. While we have sold hundreds of Rainbow tree splashbacks over the years we are certainly not under the illusion it is the best we can make. It's a suggestion. Yes a popular one but we have found most people go with the crowd and choose designs we suggest on the premise that most people will like their choice. Why though go with what we suggest when you can have something you designed yourself? What is better value of the same price? There is a lot of satisfaction to be gained from designing something truly unique. 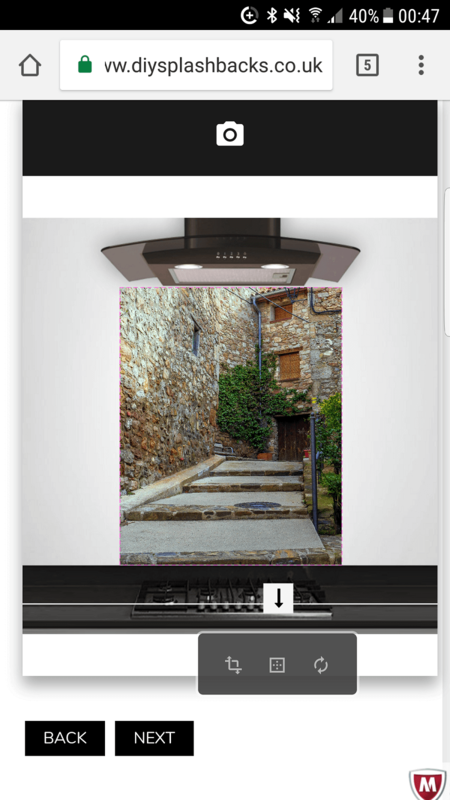 Our New splashback designer tool lets you choose from over 1.3 MILLION stock photos and patterns. Not only that you can zoom in, crop, layer and even add text to create something special, you can even find ANY image, upload your own image or photo so literally have anyhting you like...unlimited choice. Yes it make take a few minutes more but it's going to be on your wall for 7 years minimum (for most people). Take the time, it's worth it. Try our new Splashback designer today and give your lovely new kitchen the wall covering it deserves! A popular colour for contemporary kitchens lately is white- a blank canvas. Why is white so popular? Well we think it is just that exact reason, white kitchens are a blank canvas. So like an artist you can choose how to create your work of art in exactly your own style. Most people assume a coloured glass splashback should be bright, others play it safe and go for black and of course many people go for something neutral so they can accessorise. But. It is possible to play it safe and extend the notion of a blank canvas to some extent with a grey tone. As you can see from the below glass splashbacks, whilst this kitchen has full wall coverage to unit height it still allows you to add your personality to it with accessories and appliances. Throw a claret red toaster and kettle into the mix along with a colour match blind and you have created a fully coordinated look. In a few years time you can change these appliances and window dressings to a bright orange and the same kitchen is totally transformed but still perfectly coordinated. Why? Because it is still essentially a blank canvas and one that can be transformed from sophisticated and classy to fun and playful with a small financial outlay. Fancy being a little more adventurous? So many colours go with a white "blank canvas" kitchen, in fact the only reasl colour that does not is cream, so you really can use the opportunity to really reflect your own personality or create a mood in your kitchen. As the modern kitchen is now essentially the hub of the home many of our clients opt for warmer colours. Warmer colours affect your mood and help you feel more relaxed, it's a science in fact and something you should consider when choosing a colour of glass splashback or indeed the colour of any walls or soft furnishings in your home. The below warm red immediately gives you a sense of comfort and it just oozes luxury- this particular shade of red and indeed reds on this tone are actually the perfect coordinating colours for cream kitchens. Jam on top of a nice warm scone- sweet and also comforting - creating a nice room to unwind in with your family or friends.